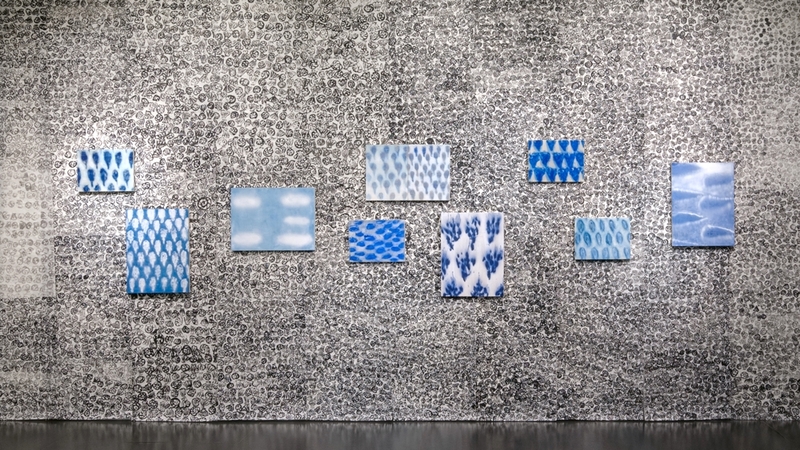 Upfor Gallery’s current exhibition of Julie Green’s installation My New Blue Friends is striking and quietly inviting. Deceptively minimal, Green’s installation taps into the senses, conjuring up subjects of home, food, and memory. 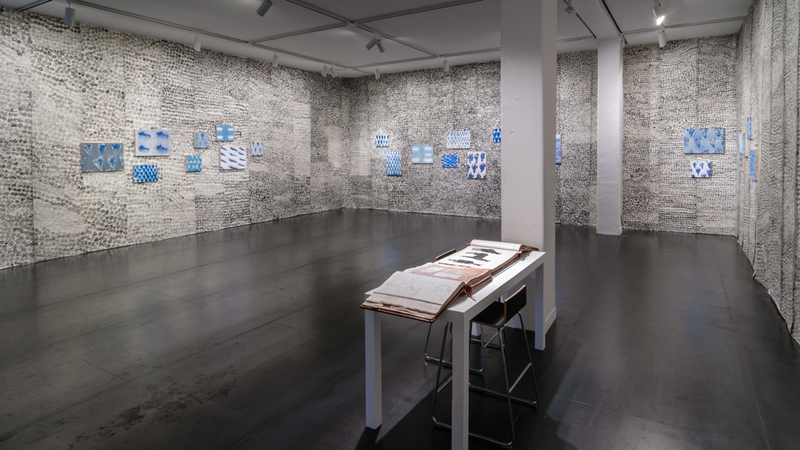 The undercurrents of labor and devotion in the works are evident throughout the exhibition, which at first feels physically vacant until its content begins to expands in its space over time. Set apart from the sterile white box of most gallery shows, Green’s installation covers the gallery walls with 200 sheets of mulberry paper. These sheets, covered in seashell forms painted in sumi ink, create a wallpaper for the gallery. The playfulness of the Pattern and Decoration movement sets in: all functional surfaces are game for being painted and designed on. Kim MacConnel’s painted drapes and sofas come to mind as well as Joyce Kozloff’s An Interior Decorated (1978-80), teetering on the narrow distinctions of decorative and fine arts. A meditative spirit is also seen in the repetition of forms. The hours dedicated to the wallpaper, the gradation of the concentration of ink from deep blacks to pale grays, the uneven sizes of the shells, and their wavering densities, add to their form as both an oscillating backdrop to Green’s paintings and a foundation for the installation. Small to medium-sized paintings hang on the wallpaper-covered walls. There are 27 in all, employing the same technique of blending the unforgiving medium of egg tempera with airbrushing. Similar to the wallpaper, the paintings take on a repetitive quality of simple forms—they take the appearance of blurred root vegetables, fruits, and clouds. Often sanded down and painted over, their layers give the appearance of a soft-glazed ceramic surface. An absorbed quality emerges from the work. Working with the difficult technique of tempera paint with airbrush, instills in Green’s the practice of yielding to a capricious outcome. Though these are very much of the artist’s hand, they are also outside of her complete control, conceding to a sense of a friendly unknown and getting-to-know. Perhaps because of these unpredictable outcomes, Green has entitled them My New Blue Friends. Like Green’s other works, An Embarrassment of Dishes is an invitation to recall one’s own moments, to share in their humor and commonalities, and to do so over the comfort of a gathering and meal. With this work, it is difficult not to recall Green’s profound body of work The Last Supper, which began in 2000 and currently continues as an ongoing project. The Last Supper documents the final meals of American inmates before they are executed. Green dedicates to half of her studio time to this ongoing work, adding 50 plates a year until capital punishment is abolished. 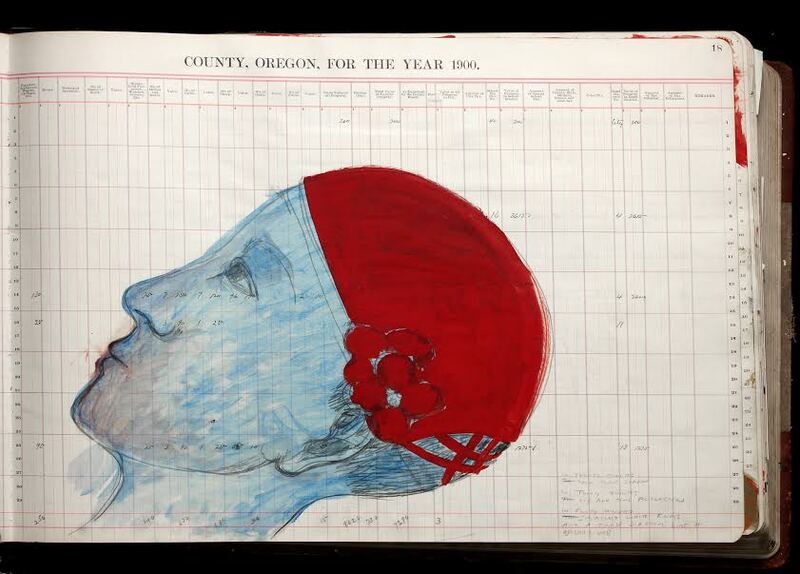 Green’s exhibition includes her antique ledgers used as sketchbook, daily ritual, and the “occasional brush-cleaning.” Like An Embarrassment of Dishes or The Last Supper, Green uses the foundation of a preexisting, much utilized object, adding and layering on the artist’s own imagery and thinking process. They are sturdy yet delicate works, and again, an offering by the artist to share what is typically private. Some of the sketches seem executed with speed, capturing an image or passing idea. They are often bold, reminding me of the qualities of William Kentridge’s charcoal drawings. The drawings span all forms and subjects—the sensual lines of cats, the study of figures, a suited man riding a horse—over the printed lines of the ledger meant for accurate county financial accounts, both erases and enhances the preciousness of the object at-hand. A final component in Green’s exhibition can only be heard—the rhythmic ticking resembling Green’s family grandfather clock. That familial sound emphasizes the interiority of the entire installation—from wallpaper to meals and memories. And it knits together all the different parts of Green’s exhibition, conjuring up different pasts and creating a narrative quilt that is deeply personal and dispersed in the realm of the shared. Julie Green’s My New Blue Friends continues at Upfor Gallery, 929 NW Flanders St., through December 19, 2015.